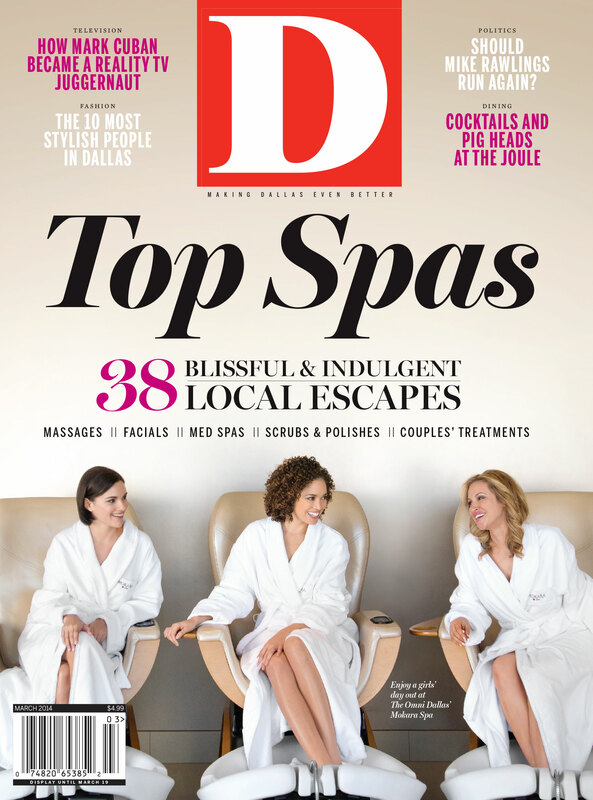 By D Magazine | 5 years ago We’ve been bronzed, buffed, plucked, and loofahed, all to bring you the top spas. It’s hard work. But someone had to do it. By D Magazine | 5 years ago Meet the city's fashion trend setters. By Michael J. Mooney | 5 years ago Don't laugh. Suzy Batiz is building an empire with her Poo-Pourri. By S. Holland Murphy and Krista Nightengale | 5 years ago Meet this year's crop of outstanding medical professionals. By Eric Celeste | 5 years ago He might look like a teamster-union boss, but when it’s time to play politics in Dallas, he avoids contact. By Tim Rogers | 5 years ago The former NPR Asia reporter returns from her travels to tell stories about North Texas for KERA. By Peter Simek | 5 years ago Here’s how to rescue the Cotton Bowl and jump-start fútbol in North Texas. By Zac Crain | 5 years ago Now coaching the Texas Legends, he knows what NBA teams are looking for from the Development League: Eduardo Najera. By Carol Shih | 5 years ago One of Dallas’ most revered bars searches for a new home for its extended family. By Nancy Nichols | 5 years ago Tristan Simon’s restaurant empire is back in a big way. By Nancy Nichols | 5 years ago The man behind Cane Rosso branches out to please New York-style pie fans. Restaurant Review: Crisp Salad Co.
By Carol Shih | 5 years ago It's a build-your-own adventure. By Carol Shih | 5 years ago Delicious and fast Vietnamese options in Richardson. By Tara Nieuwesteeg | 5 years ago Moonshine is an original American spirit. Leave it to this Frisco bar to serve up 27 legal varieties. By Jeanne Prejean | 5 years ago Our annual salute to the most important players in town. Not that they want to be noticed. By D Magazine | 5 years ago Here are more of the outstanding health care professionals nominated for this year's honors.